Good decisions are a win-win. Great ones are a win-win-win. So what do you call one with 18 wins? You call it Grand Canyon University Golf Course. championship-style bunkers and, maybe most important, the mature trees that provide plenty of shade. The oasis at 59th Avenue and Indian School Road is scheduled to reopen Jan. 1 after an 11-month transformation that has rejuvenated venerable but no longer viable Maryvale Golf Course. Just like that, a 54-year-old facility is far more than a nice, little “muni” — it’s now a championship layout that’s challenging for the best players and yet playable for the less skilled. The University came in as more than just a $10 million investor to renovate and manage the course — it came in with a plan. 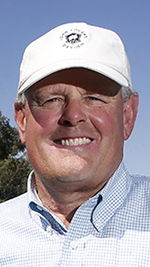 President Brian Mueller is an avid golfer who turned all four of his children into excellent players, and he was passionate about making much more than minor adjustments. “That’s a 130-acre piece of property with mature trees, lakes — a total parkland course,” he said. “But it was decaying, losing $250,000 a year, people talking about shutting it down. That would be a huge loss to the west side. And then, obviously, it’s about three miles from campus. The course is a nice mix of parkland, water and trees. That’s just the start of all the benefits, however. 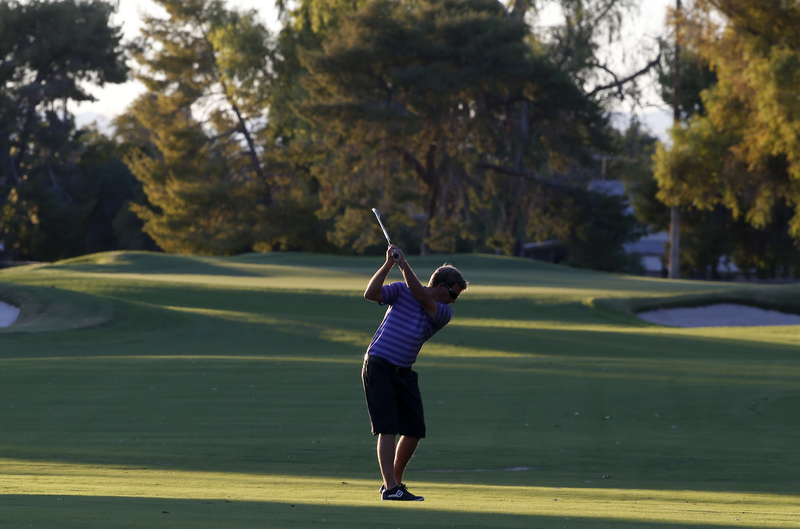 What makes GCU Golf Course a win for every hole out there? Let us count the 18 ways. 1. It’s a win, first and foremost, for golfers. Anyone who played Maryvale will barely recognize it. The only things that remain from the old course are the trees (and not all of them — some were removed to widen fairways) and the rough. Every green was rebuilt and every bunker is new. 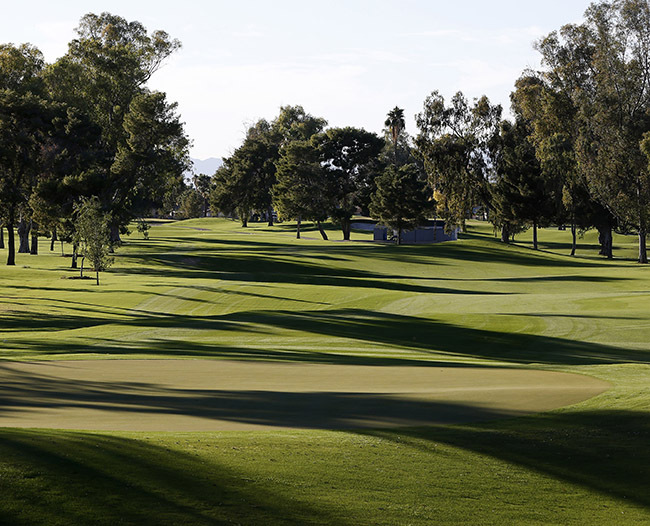 GCU Golf Course has five sets of tees on every hole, from way up for the short hitters to way back for the big bombers, and can be played at 5,074 yards or stretched to 7,269 — 600 yards longer than it was before. Par was changed from 72 to 71 by turning the 10th hole, previously a par-5, into a long par-4. 2. It’s a win for golfers’ budgets. 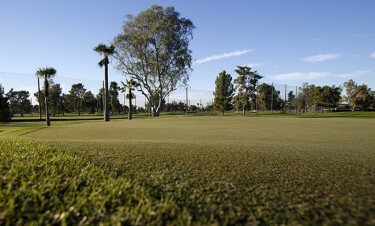 Like the new Grand Canyon University Hotel, the golf course will be affordable. For Phoenix residents and GCU employees and students, the greens fee will be $30 during the week and $35 on weekends and holidays, and the general public will pay only $35/$45. The cost of playing a championship course typically runs into triple digits. 3. It’s a win for Valley golfers who want a different playing experience. Those $100-plus rounds at Arizona courses also typically come on layouts that require shots over and around the don’t-go-in-there desert brush. That means more lost balls, more frustration and longer rounds. And many top courses force golfers to take a motorized cart because of the long distances between greens and tees — or simply because they make extra money from cart rentals. The greens will be fast and true. GCU Golf Course is golfer-friendly in another way: The “trouble” (out of bounds, water hazards) is rare and is mainly on the left, an important factor considering that 90 percent of golfers spin the ball from left to right. No matter how you slice it, this speeds up play. 4. It’s a win for property values around the course. Numerous organizations such as the National Association of Realtors and the Appraisal Institute agree that living on a thriving golf course is right up there with a good school system for having a positive effect on home values. Conversely, living on a decaying or recently shuttered course can drag down values. The fourth hole is a pretty par-3 over the water. 5. It’s a win for GCU’s partnership with Habitat for Humanity. The Canyon Corridor project, in which the University has pledged $700,000 to help Habitat for Humanity renovate up to 700 local homes, has been expanded to include 50 homes in the neighborhood around the golf course. With students and staff providing the sweat equity, the number of remodeled homes in the area immediately surrounding the campus was approaching 100 heading into December, and now the scope will be expanded west by three miles. 6. 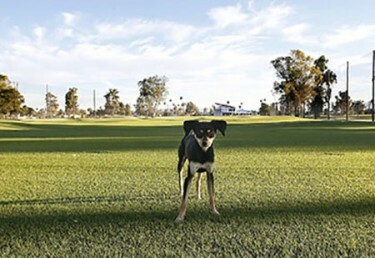 It’s a win for GCU’s golf course management program. The students in the Colangelo College of Business’ golf course management program, which began in August, will get a unique experience: They’ll be there for the actual opening of a golf course. In addition, their golf lab class will be held at the course’s 22,000-square-foot, two-story clubhouse. “Having our own golf course, operated by GCU and our students, makes this a one-of-a-kind program,” said Dr. Randy Gibb, the CCOB dean. 7. It’s a win for GCU’s hospitality management program. Students in the hospitality management program, who have been getting on-the-job experience as the staff of the new Grand Canyon University Hotel, also will have a big hand in the golf course — they’ll make up most of the staff in the clubhouse restaurant, which will feature 30 menu items at reasonable prices. There will be the classics, such as burgers and a pastrami sandwich, and plenty of salads and other low-carb options. The view of the ninth hole from the clubhouse will make sitting in the restaurant even more relaxing. 8. It’s a win for people who want a good customer experience but don’t want to pay a fortune for it. 9. It’s a win for people who like a good restaurant in a nice setting. More and more golf courses are focusing on making the clubhouse amenities as good as the on-course experience, and that starts with a high-quality restaurant that’s a nice place to hang out. GCU Golf Course will be no different, and the clubhouse will feature a wonderful view of the course below. It also will carry a private-label beer produced for GCU by Grand Canyon Brewing Co. in Williams, Ariz.
10. It’s a win for the city of Phoenix. 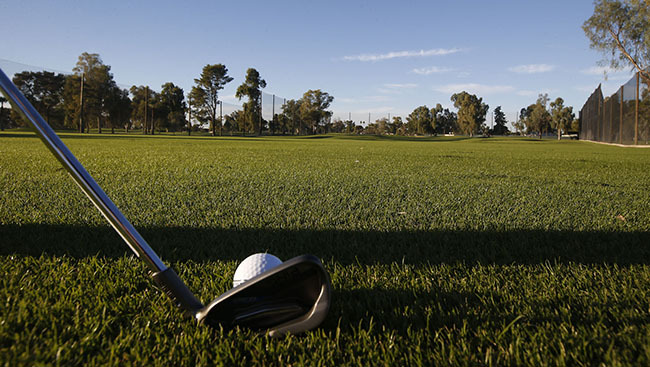 “The more the city partners with Grand Canyon University, the better off both of us are,” Phoenix Mayor Greg Stanton said at the press conference in January announcing the golf course partnership. And this was a case where a partnership was sorely needed. The fact is, most municipalities are ill-equipped to run golf courses because they can’t or won’t budget the money the infrastructure needs. Earlier this year, Salt Lake City closed three courses that were $800,000 in the hole and needed $20 million in renovations. The mayor of Houston threatened to turn a historic course into a botanical garden unless local residents could raise $15 million to improve it. GCU’s 30-year partnership with the city immediately benefits Phoenix’s budget by saving $250,000 a year. “It’s a risk, but if you don’t take the risk it continues to deteriorate,” Brian Mueller said. GCU women’s golf coach Lauren Giesecke (above) and men’s coach Mark Mueller will be able to show recruits a championship course close to campus that has a private practice area and a team room on the second floor of the clubhouse. “That’s going to be pretty much where our players live,” Giesecke said. 11. It’s a win for the west Phoenix economy. A large part of GCU’s mission is to be a leader in west Phoenix, and this is just one more way to encourage companies to make this a destination. “We’ve got to talk people into planting the flag here and staying here,” Brian Mueller said. 12. It’s a win for people in the area who need new employment opportunities. The University ranks 47th on The Arizona Republic 100, which lists the state’s largest employers, and keeps adding new work venues — first the hotel, now the golf course, in the future a conference center. Like the hotel, the course will employ people from the local community as well as students. 13. It’s a win for junior golfers. Brian Mueller’s kids all played junior golf, and his goal is to build one of the top junior programs in the country. 14. It’s a win for GCU employees. “Sunset golf” is a nice way to practice or just get in a few holes after work, and GCU employees have that option at a place that’s accessible and affordable. And they also will have a new lunch spot. “I’m hoping that a lot of people will go out there and get to know each other better,” Brian Mueller said. 15. It’s a win for the GCU golf teams. No longer will they have to trek long distances to practice — now they will have their own course with a private practice area three miles from campus. There will be coaches’ offices in the clubhouse plus a players’ lounge where they can relax and do homework. Another attractive feature for golfers is the driving range (left), conveniently located close to the clubhouse. It has plenty of well-manicured grass tees and a half-dozen greens to use as targets. 16. It’s a win for organizations looking for good tournament venues. The course already is attracting top events, such as the Arizona College Football Championship Golf Classic in January. 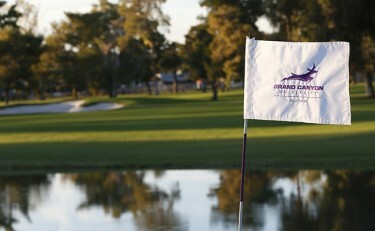 There also will be a nine-hole tournament Feb. 20 for GCU alumni in town for homecoming weekend. Brian Mueller said his goal is to someday attract one of the NCAA national tournaments. 17. It’s a win for golfers who appreciate the way a course is laid out. Purists will be pleased that the routing of the historic course was not altered despite the temptation to reverse the nines and turn the ninth green into an amphitheater-like setting with the clubhouse directly behind it. That’s still an option for tournaments, but the planners all expressed their affinity for Nos. 16 through 18, which are classic finishing holes with a good mix of water and bunkers. construction and has found a home. His name? Tiger. 18. It’s a win for golf, period. The game often is criticized for being too expensive and taking too long, but it’s still one of the only sports that can be played by people of all ages and fitness levels. And the benefits don’t stop there. “I think it’s a great game for a lot of reasons,” Brian Mueller said. “It requires a tremendous amount of discipline. You’ve got to work really hard at it to play it well. It’s one of the only games that’s self-regulated from a rules perspective — people call penalties on themselves. It’s a competitive game, but it emphasizes respect for your opponent and civility in the midst of competition. The golfers who have built relationships at Maryvale Golf Course are ready for their new home. This is one time when winning is everything … and everyone wins. But is it a win for GCU students? How much does it cost for them to play? Students can play for $30 Monday-Thursday, $35 Friday-Sunday.